Can farmers markets fix Chicago’s food equity problems? Once a month during harsh Chicago winters, the 61st Street Farmers Market transforms the warehouse-like Experimental Station on 61st and Blackstone into a space of hustle, bustle, fresh produce, and made-to-order meals. People are chatting and catching up, joking around and getting their blood pressure taken. Many customers and vendors are on a first-name basis. Everyone is carrying around and exchanging oddly colored money that looks like it came out of a Monopoly box, and the friendly atmosphere adds to the sense that one is standing inside a utopia of healthy food. Connie Spreen, who lived in Woodlawn from 1988 to 2007 and now lives in Kenwood, launched the market in the summer of 2008 after realizing that “there really was nowhere to get any food in the neighborhood.” As a PhD student at the University of Chicago, Spreen recalls having to travel more than a mile north in Hyde Park for food that wasn’t “chips and soda pop.” After empty promises from city officials to build supermarkets in the ward, she decided to do what she could to bring healthy food to Woodlawn and surrounding communities; eventually, she settled on the farmers market model. Many—in fact, most—farmers markets around the South Side were started with the same mission as 61st Street: to provide fresh and healthy food for areas lacking easy access to markets or grocery stores. In other words, to carve out a space for food oases in places that were, and are, otherwise considered food deserts. As winter comes to an end and Chicago becomes warm enough to set up tables and tents outside, farmers markets around the city enter a state of transition. 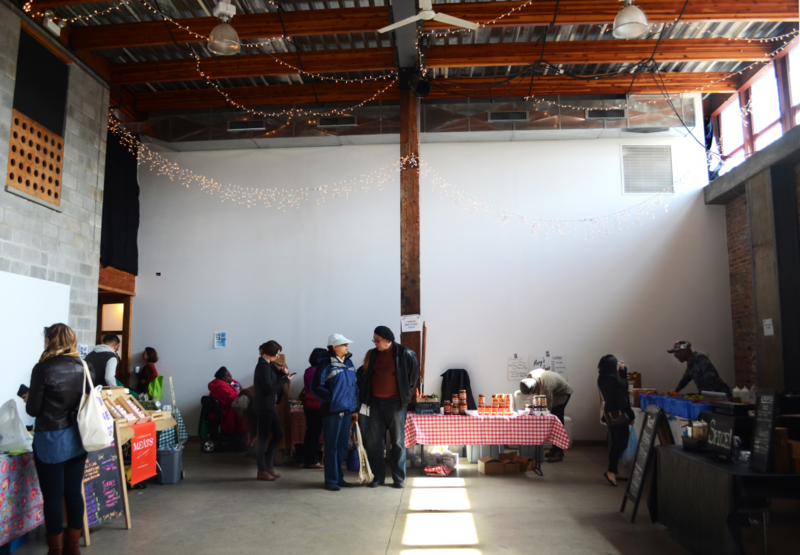 The Experimental Station, Pilsen Community Market, Hyde Park Handmade, and The Plant’s Monthly Market in Back of the Yards are among those taking place indoors through April before moving outdoors and running on a weekly schedule for the summer and early fall. As a part of an ongoing effort to engage with food politics in the city, the Department of Cultural Affairs and Special Events (DCASE) is curating this year’s city-run markets and will release a full list of their own and independently run markets in the coming weeks. Both city-run and independent markets tend to run with similar goals in mind—many market-running entities, like the Pilsen Community Market, Experimental Station, and DCASE, take into consideration communities’ access to affordable, fresh foods. A 2009 study by Canadian scholars Kristian Larsen and Jason Gilliland found that bringing farmers markets to food deserts is effective both in increasing available healthy food options and lowering the price of food for residents in general. But these ends can’t be reached by simply plopping markets down in the streets of low-access areas, hoping people will line up to buy artisanal breads, aquaponic-farmed microgreens, and ethically produced honey. The on-the-ground realities of implementing farmers markets in the context of social justice complicate and challenge the idea of health utopias, like the one on 61st Street has managed to cultivate. The United States Department of Agriculture defines a food desert as a geographic area that qualifies as low-income and low-access: twenty percent of residents (or more) are below the poverty line, and at least a third live more than a mile away from a supermarket. There are three clusters of food deserts in Chicago: one on the West Side (including Austin and parts of the Near West Side), one on the South Side (including parts of Englewood and West Englewood, Washington Park, Auburn Gresham, and Ashburn), and one on the Far South Side (including South Deering, Pullman, South Chicago, Beverley, Washington Heights, and Riverdale). Market vendors often have a hard time selling at farmers markets in these areas, especially when the market is just getting started or hasn’t yet fully developed. This is often because markets are more expensive than grocery stores and supermarkets, with prices for organic or sustainably-grown produce sometimes double or triple those of their mass-produced counterparts. One resulting roadblock is an unpredictable turnout; it can be difficult to balance the number of customers that shop each day with the number of vendors selling. Spreen, from the 61st Street Market, said that bringing vendors to the South Side is more difficult than it would be in a place like Lincoln Park or Logan Square. One vendor she has drawn to 61st Street is Al Mikell of Ellis Family Farms, based in Ann Arbor. Mikell said that he’s had “terrible experiences” selling in similar areas, that people in food deserts with new farmers markets “don’t come out” and buy food. “When people aren’t buying food, farmers and other vendors don’t profit and have no incentive to sell at those markets,” he said. Many vendors that sell at South Side markets in low-access areas such as Englewood and Garfield Park—vendors like Growing Power and Urban Canopy—share these markets’ visions of food justice. Yet even for them, the lack of customers at some markets on the West and Southwest Sides can be demoralizing and deter them from selling there, leading to the dissolution of those markets. But now that many markets accept electronic LINK card payment, low-income customers for whom the transition from paper food stamps to LINK’s electronic balance became a barrier to markets’ healthy food access are now better off. Spreen worked with the city to implement electronic LINK payment—also known as SNAP and EBT—at markets in 2010. Additionally, markets have a matching program: a customer spends, say, ten dollars and is automatically given an extra ten dollars to spend at the market. With this matching program in place, a person can buy up to fifty dollars’ worth of food for twenty-five dollars at some markets. Both LINK and matching programs make farmers markets more equitable across income levels, and this summer almost all markets in Chicago will accept LINK as payment for fresh produce, meat, and dairy, in addition to having double value matching. Still, information about the LINK and matching programs rarely reaches those who stand to benefit the most, raising a question Isabel Rodriguez-Vega, who tables for Urban Canopy at the Pilsen Community Market, said she encounters often: “Why do I have to pay so much?” A good question, and part of the answer, Rodriguez-Vega said, is to drive prices down by having more vendors selling at each one. But what about the initial problem: drawing vendors to markets in low-access areas? Rodriguez-Vega, Spreen, Mikell, and many others who run and sell at these markets believe that the answer lies in more food education and community outreach, which both lead back to the issue of funding. According to Spreen, most markets are not-for-profit. Both the Experimental Station and Pilsen Community Market (PCM) have 501(c)3 status, which allows them to receive large donations from private funders. But while the Experimental Station has been successful in acquiring grant money—Spreen works with the city and other markets to implement tactics she has used, and the 61st Street market is considered the best on the South Side by many in the business—PCM’s biggest roadblock is funding. Kelly Fitzpatrick’s position as market manager is the first paid position PCM has created, and until they gather enough money to hire a full-time community outreach worker, their market will remain inaccessible to many of the people it wants to help. The 61st Street market has begun drawing from the health sector for funding in exchange for tracking consumer data. At every market, customers have the option of getting their health metrics taken, and the market keeps track of these numbers—blood pressure, height, and weight—from week to week, correlating weekly changes with the types of food customers are buying with their LINK cards. In exchange for their data, customers receive five market dollars, plus five more for signing up with a project called South Side Diabetes. Spreen said that health insurance agencies like Harmony and the University of Chicago Medical Center are interested in this data, and this new area of collaboration between separate sectors of city life helps both thrive. On the customer side, this sort of tracking can be helpful, but also runs the risk of being invasive and patronizing. Spreen and Fitzpatrick agree that funding is more difficult to come by for their independent markets than it is for those curated and incubated by the city government. Many private organizations get bored of “the mission” after a couple of years, especially if that mission doesn’t seem to be reaching its goal within a short amount of time—which they rarely do. On the other hand, markets organized by the city are funded publicly by the city government’s budget, and get a head start because DCASE runs the market for three seasons before passing management off to a community organization. Last October, DCASE received almost $89,000 in grants from the USDA’s Farmers Market Promotion Program to support “producer-to-consumer” food initiatives over the next two years. The money will go to markets in Englewood, Pullman, and Austin: all neighborhoods in food desert census tracts. Christine Carrino, the public relations and marketing director for DCASE, said that food deserts are one of the city’s primary concerns when deciding where to place the markets that they “incubate” for three seasons, along with the concern of whether the community can sustain that incubation. But despite the somewhat more accessible funding, city markets are run by one person only: Program Coordinator Yescenia Mota. As Spreen said about the difficulty of creating markets that last, “even if you get a bunch of funding thrown at you, it takes constant commitment and a lot of dedication” to run just a single market. So how could a single person coordinate between nineteen and twenty-two successful markets that truly help combat food inequity? This summer, the first ever in which all city-run markets will accept LINK as payment, will give us the answer. As the city gears up to announce the full list of this season’s markets around the city, Mota answers her office phone more and more rarely. The Pilsen Community Market, a site similar to 61st Street, is in its indoor season until April 19. Inside Honky Tonk BBQ on 18th and Racine, market manager Kelly Fitzpatrick was on duty helping vendors find space to set up, dealing with technical difficulties, and offering a warm, welcoming conversation to every person who entered the building. The sense of community at PCM is perhaps even greater than at Experimental Station. Shoppers take breaks to sit at the bar and order a drink, and at one point a moment of silence is asked of the crowd for a family that was active in the market that passed away—not one person in the crowded restaurant spoke for an entire minute. Alexandra Curatolo, owner of the health food store Belli’s and a PCM board member, believes that though the market is more community-based than vendor-based, the shoppers there aren’t as reflective of the community as the board members had envisioned. “Though eighty to ninety percent of the people who shop here are from Pilsen, it’s not as diverse as we would like,” Curatolo said. Specifically, aspects of the market aren’t reflective of Pilsen’s Mexican population—though some vendors are Mexican-owned and Pilsen-based, many of them speak of “neighborhood change” leading them to cater to a more mixed audience at the market. Seven out of the eight PCM board members are white, and one is Latina. Fitzpatrick said this fact is something she and others struggle with. “We’re trying to embrace the existing culture without being offensive,” she said, but this aspect of the Pilsen market demonstrates that, albeit for different reasons, they face similar problems to many other South Side markets in reaching their intended audiences. Because many organizations that run and sell at farmers markets on the South Side are not-for-profit, Spreen believes that these markets are “a public service.” When their reach goes beyond market days through partnerships with elementary schools, local musicians, yoga groups, and the health sector, it’s not hard to believe that farmers markets are a first step toward creating cohesive communities and healthier food options for low-access areas. But as noble as a market’s aims might be, the economics at play in some of them on the South Side—what keeps them afloat and functioning—aren’t always conducive to the market managers’ goals of food equity. In a farmers market culture where many organizers and vendors believe that the solution is increased education about healthy food and the benefits of fresh produce, it is possible to forget that these initiatives aren’t the sole means to a better community. Still, as Morrison pointed out, farmers markets in their current incarnation only became popular in the United States in the last twenty years, and have only recently been thought of as viable ways to address complex questions of inequality. In this short time, South Side markets like 61st Street and PCM have managed to carve out spaces of community gathering, mourning, and bonding—and, just maybe, have begun to tackle the symptoms of health inequality. Correction: An earlier version of this article stated that one member of PCM was black. One member of PCM is Latina. Thank you fo4 your time and efforts, I will see you next visit day. A thoughtful and well- written article! Thanks to you and those who strive to bring healthy eating and a sense of community to the Chicago food deserts.